JANSSONIUS VAN WAESBERGHE - Typus Generalis Ukrainae sive Palatinatuum Podoliae, Kioviensis et Braczlaviensis terras nova delineatione exhibens. . . 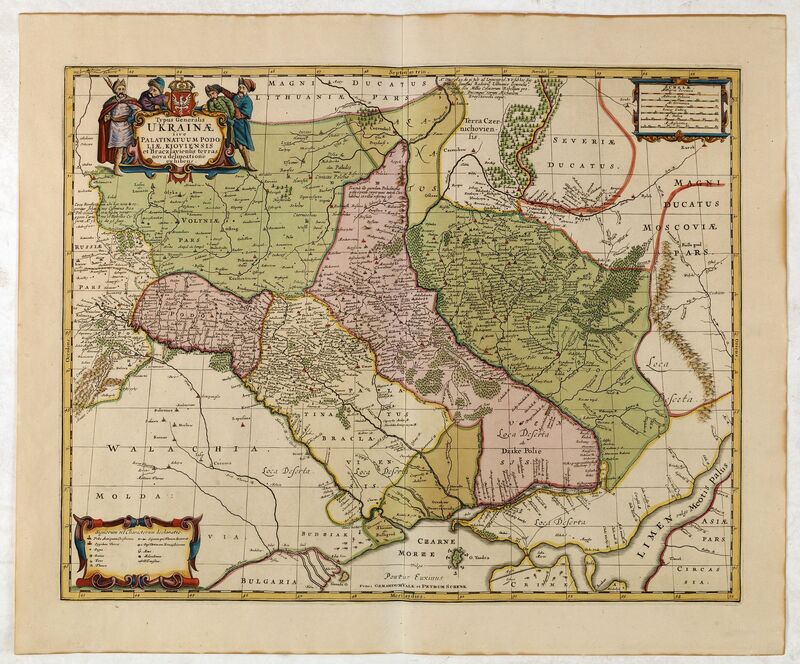 Title : Typus Generalis Ukrainae sive Palatinatuum Podoliae, Kioviensis et Braczlaviensis terras nova delineatione exhibens. . ..
Map maker : JANSSONIUS VAN WAESBERGHE. Size : 16.6 x 21.3 inches. / 42.2 x 54.0 cm. Description :Key map based on Guillaume La Vasseur de Beauplan's map of the region published in "Description d'Ukraine". The work described Ukraine as several provinces of the Kingdom of Poland lying between the borders of Muscovy and the frontiers of Transylvania. It is one of the earliest maps to include the name Ukraine in the title of a printed map. The map shows the Ukraine, divided into provinces and has two cartouches. Engraved by Joannes Janssonius, and re-issued by Moses Pitt and Johannes Janssonius van Waesberghe in London, 1680, in hisfailed attempt to continue and expand upon the Atlas Maior published by Jan Jansson. A later issue by Valck and Schenk excists. While preparing this map for printing, Jan Janszoon has slightly changed it by adding references to Loyevska (1649) and Berestetska battles (1651). Includiing a large number of geographical names, it contains historical references to famous battle, the location of the Cossack treasury (Scabnica woyskowa Kosasky). The author did specify the three Major Tatar crossings over the Dnieper (Wielka Przeprawa Tatarska) the way Beauplan did. Condition : Very good condition of this important map.